Post cereal is part of the buy 5, save $5 sale! 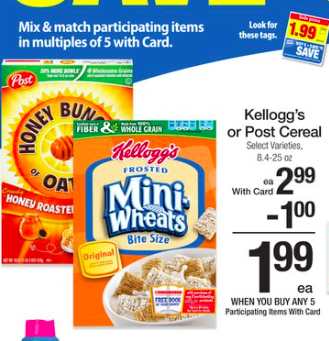 New Post Cereal coupons were released today AND there is also a catalina that is printing for some cheap cereal! Buy 2 and get $1, buy 3 and get $2 or buy 4 and get $3 coupon for your next purchase. Please note that prices vary and from region to region. The prices listed are for the Metro Detroit area! Some areas are reporting prices to be $1.49 instead of $1.99, making it a FREEBIE!!!! Final Price: As low as $0.49 each for the Bunches of Oats or Great Grains cereal!